This letter was written by Horace Winslow (1814-1905), the son of John Hathaway Winslow (1776-1846) and Elizabeth Mills (1771-1841). Horace was a graduate of Hamilton College and the Union Theological Seminary in New York City. He was ordained a Presbyterian minister in 1842 and served various pulpits in New York and Connecticut. 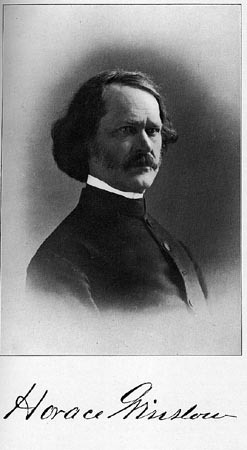 He was pastor of the Congregational Church at Greater Barrington, Massachusetts, when he accepted an appointment in February 1862 to serve as the chaplain of the 5th Connecticut. Ill health caused him to resign as chaplain and return home later in the year, however. Winslow was married in 1850 to Charlotte Henrietta Pettibone (1824-1905) of Simsbury, Connecticut. She attended the Hartford Female Seminary. Her papers may be found at the William L. Clements Library at the University of Michigan. Their three daughters were Fanny Henrietta Winslow (b. 1851), Lillian Isabelle Winslow (b. 1854), and Mary Rosetta Winslow (1860-1925). We left camp this morning and marched ten miles where we are now encamped in the country. The Col. [George D. Chapman] directed me to get quarters and we are in a large brick house — the best I have been in since I came into Virginia. I am writing in a comfortable upper room with a fire place and for once sat down to a clean table and savory food. We are at the house of a widow 82 years of age with her two maiden daughters. It is all very comfortable but the daughters are secesh. We are probably going to Gordonsville. It is reported that the enemy have 50,000 at that place and will make a stand there. We have not any such number of troops, yet Gen’l Banks will not run hazards. ² Yesterday morning we washed up, & saw the snow falling and it fell all day. It has been fog today and is now snowing. We are in the mountains crossing from Harrisonburg due southeast. I conclude we must be in high land for so much snow. We are about 70 miles from Winchester in our enemy’s country & probably shall not have an opportunity to visit the North till the war is ended or I resign. If Congress cuts down the pay, I shall resign. It is almost impossible to live now and shall give up if the pay is cut down. I think very much of the pictures. I look at them everyday. ¹ Date determined from the regimental history. ² General Banks was a political general whose military inexperience and indecisiveness cost the government dearly. In the Shenandoah Valley, Banks lost 30 percent of his troops when he was routed by Stonewall Jackson and due to his tremendous loss of supplies was dubbed “Commissary Banks” by the Confederates. As part of Pope’s army, he was defeated at Cedar Mountain again by Jackson in the disastrous Red River Campaign as well as the Second Battle Bull Run. After a brief stint in the capital’s defenses he went to New Orleans to replace Benjamin F. Butler. 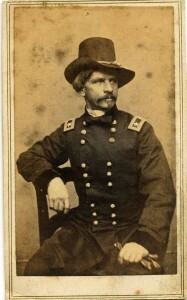 His operations against Port Hudson were met with several bloody repulses eventually falling only after the surrender of Vicksburg made it untenable.